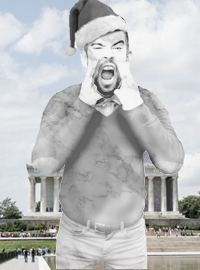 Artist’s rendering of the new War on Christmas monument featuring a white, Christian male yelling “Merry Christmas” at non-Christians. WASHINGTON, D.C. – President Donald Trump has approved the commission and construction of a new national monument to honor the lives lost in the War on Christmas. The memorial was designed by artist Trent Peterson and features a white man wearing a red stocking-cap, standing next to a stern-faced Jesus Christ, shouting “Merry Christmas” at what appears to be Jewish, Muslim and Hindu figures. The monument will be located on the National Mall in Washington DC, just in front of the Lincoln Memorial. Initial designs list the monument as over 600 feet tall and will cost $9 billion.